April 10, 2018 – Jason Fulk teamed with Charlotte attorney Stokely Caldwell to present a discussion on “Forming and Operating a New Race Team” as part of The Racing Attorney Conference (TRAC) held on April 10-11, 2018 in Charlotte, North Carolina. The pair presented a checklist to provide guidance regarding a number of integral issues of which all new race team owners should be aware, including matters such legal organization, employment, licensing, asset acquisition, financing, sponsorship, intellectual property, and media. First held in 2008, TRAC is an annual event that combines education, development and networking with leaders in the motorsports industry. The two-day conference provides an in-depth analysis of current industry issues that affect NASCAR, INDYCAR, Formula 1, and other racing series, venues, sponsors and participants. TRAC is planned and presented by the Indianapolis Bar Association Sports and Entertainment Law Section and the North Carolina Bar Association. 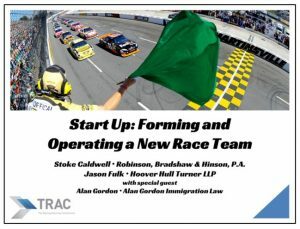 Visit www.racingattorneys.com for more information about TRAC and registration for the 2019 conference. Contact Jason Fulk today to learn more about Hoover Hull Turner LLP’s motorsports law practice or to inquire about representation in a specific matter.